Prince Albert had assumed the presidency of the Society of Arts, in John Adam Street below the Strand, in 1845, when he was not quite 26. Its modest goal was to encourage technology and manufactures. It distributed a few prizes. He encouraged an exhibition in its handsome building, and to the astonishment of everyone, 20,000 Londoners came. 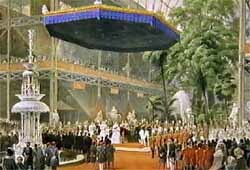 It was a spur to further annual exhibitions, and on June 30, 1849, at a meeting at Buckingham Palace that Albert summoned to plan a more ambitious project, a grand "Industry of All Nations" exhibition for 1851 was approved. Albert planned to organize and direct it personally as the only way to secure financial guarantees and make it self supporting. That would not prove easy, even after Victoria appointed a full Royal Commission early in 1850, a prestigious sampling of bankers, brokers, scientists, engineers, architects, artists, merchants and Members of Parliament. For public reassurance, the treasurers were bankers Arthur Barclay and Lionel de Rothschild, and other members included mathematician Charles Babbage, inventor of the first calculating machine; Isambard Kingdom Brunel, designer of great ships, docks, and bridges; and Robert Stephenson, railway engineer and son of the builder of the first locomotive. With Albert chairing the almost weekly meetings, the two foremost subjects seemed always to be money to back the enterprise, and where to locate the sweeping exhibition. The Queen subscribed an initial thousand pounds and Albert 500, with amounts equal to his offered by bankers Joshua Bates, Thomas Baring, Lionel de Rothschild and Antony de Rothschild. (These were huge sums, given the contemporary purchasing power of the pound.) Yet prosperous merchants like safe manufacturer Charles Chubb managed only a measly � and the head of the Bank of England, H. J. Prescott, a paltry �. But the Prince's funding worries, with a May 1, 1851 opening date promised, were nothing compared to the problems of a site and a structure. Albert wanted Hyde Park, but politicians and abutting property owners decried the desecration of the area, and some opponents refused to consider London at all. "The strangers [coming from abroad], they give out," Albert wrote, "England having escaped the overturning of Continental regimes in 1848, "are certain to commence a thorough revolution here, to murder Victoria and myself, and to proclaim a Red Republic..."
The Commission nevertheless called for a competition for a building design, and promised to preserve every tree in the park, as well as to dismantle the structure afterwards and restore the site. Cartoons in the press satirized proposed exhibition architecture, and offered even more outlandish designs invented for the fun of it. Fund-raising as well as building plans stalled. No plan seemed likely to work. 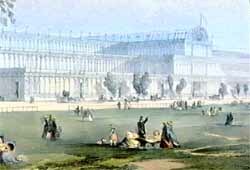 With 13,937 applications from around the world to exhibit, and nothing on the horizon into which to put their work, a rescuer was urgently required, and one emerged -- Joseph Paxton, whose grand-scale greenhouse architecture at Chatsworth, country seat of the Duke of Devonshire, Prince Albert had long admired. 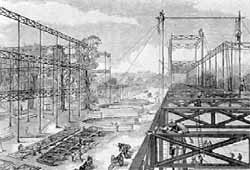 Paxton consulted with manufacturers and engineers, and brought in his plans nine days later. He proposed what he described as a "palace of glass," in an iron frame -- in effect an elegant greenhouse that could go up quickly and be disassembled when its usefulness had ended, and which would also combine size with strength. The huge structure was to be 1,848 feet long -- a third of a mile -- and 408 feet wide. (Paxton wanted a symbolic 1851 feet in length, but the dimensions would not work.) Entire large trees would be enclosed rather than removed. Sceptics immediately charged that so much glass would create a hothouse climate inside, and be too flimsy to withstand wind and rain. Yet it proved to be sturdy and affordable, and became the first major building to be erected with prefabricated materials -- one of the great engineering achievements of the century. As it went up, now to public excitement and awe, Punch, which had deplored the concept in each weekly issue, christened what was formerly Albert's folly a "Crystal Palace." It caught on. The structure, and the preparations that went on around it, altered the face of London. Slums around the site were cleared. The Marble Arch was moved from the Buckingham Palace grounds to the northeast corner of Hyde Park. Trafalgar Square was finally completed, but for Edwin Landseer's lions (added only in 1868). Areas about new railway junctions underwent building booms, expanding living space -- a crucial matter as, in 1851, 2,362,000 people were crowded into a far smaller London where stinking open sewers, soon to be covered, still flowed into the Thames. Kensington, abutting Hyde Park to the west, would become citified, and to the southwest, Old Brompton lost its fairgound and market gardens to urban expansion. London was reaching into its former suburbs and adjacent villages. As the technological marvel was being constructed frenetically out of parts that were only ideas on paper a few months earlier, Albert was everywhere inside and out of it, supervising the exhibit spaces, settling a workmen's strike, competing for public attention with brewers' drays that brought 250 gallons of beer daily for the 2,000 laborers. He also had to find the funds for a �,980 cost overrun. But season tickets, exhibitors' fees, and the enthusiasm to invest in what now looked like a success paid all the bills. 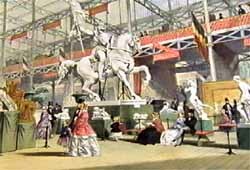 The exhibition opened on the day scheduled Victoria, who formally opened the Great Exhibition, told her uncle Leopold, King of the Belgians, that it was "astonishing , a fairy scene. Many cried, and all felt touched and impressed with devotional feelings." In her diary she wrote of the "tremendous cheering, the joy expressed in every face," and praised her husband for organizing the "Peace Festival," which was "uniting the industry & art of all nations of the earth." It was a reaction experienced even by onlookers who had been wary of it, historian Thomas Macaulay writing of "a most gorgeous sight; vast; graceful; beyond the dreams of the Arabian romances." The Crystal Palace was more than a happening. Lady Charlotte Guest, wife of a Welsh iron-and-steel baron as well as a writer and translator, recognized that "all this pomp and panoply were called together to do honor to the industry of millions, whose toils, erst scorned upon, seemed suddenly ennobled." The dazzling exhibitions were also a triumph of technological communication, as inventions and artifacts and manufactures from all over the world were gathered and organized in one place to reveal the realities of creativity at mid-century. Punch, usually an organ of satire, called it "the grandest and most cheerful, the brightest and most splendid show that eyes had even looked on since the creation of the world." Cheap tickets enabled the working classes to attend, many families traveling by railway for the first time in their lives. Yet there was no disorder among the crowds swelling London, nor any in the Crystal Palace, even when, on October 7, 1851, 109,000 people came through the building, many having arrived by ship from the Continent and even from America. For many, it was their first glimpse of the technological future and of an English pre-eminence in mass-produced industrial goods that, ironically, the inevitable spread of know-how afforded by the Exhibition would soon threaten. The first "World's Fair," it was a complete success. Prince Albert called it, while planning the closing ceremonies in mid-October, "not only a work of great national utility, but of European usefulness." He was barely 32 at the close, and held no English rank or title except for honorary Field Marshal, but the immediate result was a prestige he had never before known and which would never be higher in the 10 years more he would live. The next April, the emptied Crystal Palace (exhibitors had to guarantee removal of their property) was sold, and moved in sections across the Thames to Sydenham, for reconstruction on a hill at Penge Park, and would attract great crowds as a concert and exhibition hall. The profits of the fair and the dismantled structure had already exceeded �0,000. Disposing of the surplus was a politically sensitive matter. The Prince's plan was to use some of the funds to purchase eighty-seven acres in South Kensington to continue the technological and educational goals of the Great Exhibition. Sceptics would label the idea "Albertopolis," but the cultural and scientific institutions initiated by Albert's foresight would materialize into a great complex of museums, colleges, and concert halls that would keep the then-widowed Victoria busy at dedications for decades. Overlooking them from the southern edge of Hyde Park, within the neo-Gothic Albert Memorial, the seated Prince, in John Foley's gilded bronze statue, holds on his right knee one of the volumes of the Great Exhibition catalogue, his forefinger slipped into its pages as if he is anxious not to lose his place while he looks over his legacy. The Royal Commission for the Exhibition of 1851 operates, still -- now under the presidency of another queen's husband, Prince Philip, Duke of Edinburgh. The interest from the unexpended surplus remaining after the establishment of the South Kensington complex now runs annually into hundreds of thousands of pounds. Much of this income is used to fund fellowships and other grants in science, engineering and the arts, and awardees have included 11 future Nobel Prize awardees. Buses and trains still stop at "Crystal Palace" in Sydenham, but the structure is no more. A fire swept through it in 1936, destroying the landmark just before the wartime Blitz of 1940-41 would, very likely, have brought it down.